The 2015 Honda CR-V enriches its class-leading formula with a host of improvements, including much better fuel economy. If you're shopping for a top-shelf compact SUV, the CR-V remains one of your best bets. Exceptional fuel economy; abundant passenger and cargo room; nifty self-folding rear seats; appealing tech and safety features. As it happens, the CR-V has been refreshed for 2015, offering more mpg, fresh features and even a few styling tweaks. The juice, in other words, is smoother and sweeter than ever. The headline this year is the CR-V's revised 2.4-liter engine that's paired with a CVT (essentially, the engine/transmission combo you get in the Accord). The result is a little more torque and a lot more fuel efficiency. With an EPA-estimated 29 mpg combined with front-wheel drive, the 2015 CR-V is 3 mpg better than last year's model and among the most fuel-efficient non-hybrid crossovers on the market. On the outside, Honda has added LED running lights and new front and rear fascias, while the interior benefits from extended touchscreen availability, mildly improved materials and a more traditional center console design. There's also a top-of-the-line Touring trim, which comes with extra luxuries and advanced safety systems. Still, this Honda's appeal lies largely in what was already there. The CR-V practically invented the genre with its high driving position and carlike handling, and the current model adds a particularly spacious backseat and cargo hold to the mix, the latter enhanced by a nifty spring-loaded mechanism that folds each rear seat at the pull of a lever. Low ownership costs and high resale value further bolster the CR-V's credentials. Of course, Honda isn't the only company fielding a highly popular small crossover. The 2015 Toyota RAV4 is also excellent at meeting the needs of crossover shoppers. If you want something with a little more personality, we recommend the athletic-handling 2015 Ford Escape or 2015 Mazda CX-5. The Escape also offers an engine upgrade if you want more power, as do the 2015 Hyundai Santa Fe Sport, the 2015 Jeep Cherokee and the 2015 Subaru Forester. But for a great many households, this Honda, which earns a top spot in our 2015 SUV Buying Guide as well as an "A" overall rating, will hold more overall appeal than the alternatives. The LX comes standard with 16-inch steel wheels, full power accessories, a rearview camera, cruise control, air-conditioning, a height-adjustable driver seat, a tilt-and-telescoping steering wheel, a 60/40-split-folding and reclining rear seat with trunk-mounted release handles, Bluetooth phone and audio connectivity, and a four-speaker sound system with a CD player, an auxiliary audio jack, an iPod/USB audio interface and Pandora Internet radio compatibility. The EX adds 17-inch alloy wheels, automatic headlights with LED running lights, a sunroof, foglights, rear privacy glass, a retractable cargo cover, keyless entry and ignition, an eight-way power driver seat (with two-way power lumbar), heated front seats, a blind spot monitoring system with a camera that shows your passenger-side blind spot (Honda's LaneWatch), a 7-inch touchscreen, dynamic guidelines for the rearview camera and a six-speaker sound system with an extra USB port. The EX-L adds roof rails, heated side mirrors, an auto-dimming rearview mirror, dual-zone automatic climate control, leather upholstery, satellite radio and a seven-speaker sound system. The Touring tacks on 18-inch wheels, projector beam headlights, a power liftgate, adaptive cruise control, a forward collision mitigation system, a lane departure warning system, driver seat memory settings, a navigation system and HD radio. Every 2015 Honda CR-V comes with a 2.4-liter four-cylinder engine rated at 185 horsepower and 181 pound-feet of torque. A CVT is the only available transmission. Buyers can choose between front- and all-wheel drive on all trims. The EPA's estimated fuel economy on 2015 CR-Vs with front-wheel drive is 29 mpg combined (27 city/34 highway), a superb showing for this segment. The all-wheel-drive CR-V, at 28 mpg combined (26 city/33 highway), is right behind. In an Edmunds acceleration test, an all-wheel-drive 2015 CR-V accelerated from zero to 60 mph in 8.8 seconds, which is a bit quicker than average. 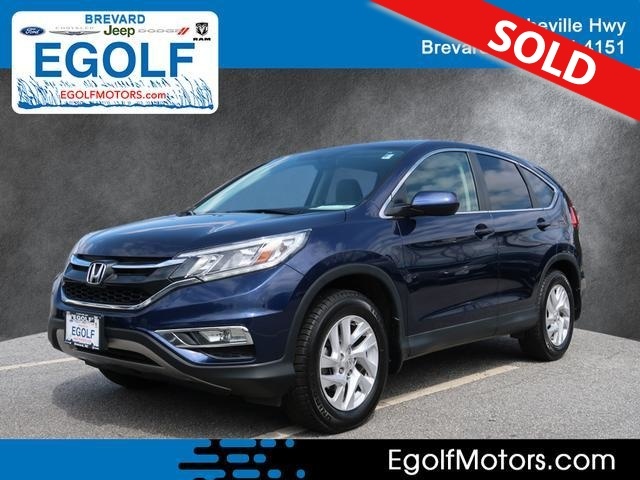 The 2015 Honda CR-V comes standard with antilock brakes, stability and traction control, front seat side airbags, side curtain airbags and a rearview camera. The LaneWatch blind spot monitoring system (featuring a camera of its own that displays passenger-side blind spot activity on the 7-inch touchscreen) is standard on all but the LX. The Touring boasts a lane departure warning system and a forward collision warning and mitigation system that's able to distinguish between vehicles and pedestrians (and warn the driver accordingly) as well as apply automatic braking intervention to reduce the severity of a collision. In government crash tests, the 2015 CR-V earned four out of five possible stars for overall crash protection, with four stars for frontal crash protection and five stars for side crash protection. During Insurance Institute for Highway Safety testing, the 2015 Honda CR-V received the highest possible rating of "Good" in the small-overlap and moderate-overlap frontal-offset impact tests. It also earned a "Good" score for the side impact, roof strength and whiplash protection (head restraints and seats) tests. The IIHS also tested the CR-V's optional frontal collision warning and mitigation system and gave it a top rating of "Superior." During Edmunds performance testing, an all-wheel-drive 2015 Honda CR-V came to a stop from 60 mph in 119 feet, which is a few feet shorter than average for the class. There have been changes, though. The front cabin's center console has adopted a more traditional design, ditching last year's seat-mounted, van-style armrests and the long, deep bin that could swallow a purse. There is now a console-mounted, armrest-covered bin with just enough space for a few items inside, along with two accompanying cupholders, a small card-sized cubby and a longer one with a grippy surface for holding smartphones. In other words, it's better for small items, less so for big ones. Honda has also added soft-touch dashboard inserts with simulated stitching to give the CR-V a more premium vibe, but these we find less successful. The current-generation CR-V has utilized subpar plastics in various cabin locations from the get-go, and most of them have stuck around for 2015. Numerous rivals look and feel more upscale inside. And although most controls are logically laid out and easy to learn, the widely available 7-inch touchscreen (EX and above) suffers from some difficult-to-decipher buttons and an occasionally confusing menu structure. We also dislike the lack of volume and tuning knobs. Power or no, that liftgate reveals one of the most user-friendly cargo areas in the compact SUV segment. The 2015 CR-V can carry 35.2 cubic feet of cargo behind the rear seats. That area benefits from a low load floor and a boxy shape overall, making it easier to carry large items or dogs. Lowering the spring-loaded, auto-folding rear seatbacks with a tug of the trunk-mounted levers reveals 70.9 cubic feet of maximum space, which is one of the top figures in the segment. The 2015 Honda CR-V features revised suspension tuning across the line, as well as wider wheels (by half an inch) on the EX and above. While the CR-V isn't exactly a sporty crossover, it does have a very smooth ride and the suspension soaks up many of the bumps along the way. There's also less noise at speed this year due to improved insulation, but we already praised last year's CR-V for its relatively quiet cabin, and the improvement for 2015 is subtle. In short, the CR-V continues to provide a satisfying blend of respectable ride comfort and secure handling. This year's CR-V has a new CVT. In our experience, some CVTs can seem odd in the way they change and adjust the engine's rpm compared to traditional automatics. But to Honda's credit, the CR-V's CVT doesn't draw attention to itself in normal driving; indeed, it's so unobtrusive that you tend to forget it's there and it is indeed one of the better CVTs out there. We will note, however, that in Edmunds.com consumer reviews, many consumers have complained about distracting vibrations in their 2015 CR-Vs. It's something you'll want to look out for if you're test-driving a current CR-V.As for the new engine, it adds a theoretically useful 18 lb-ft of torque along with a power peak that arrives 600 rpm earlier, but it's hard to discern a difference on the road unless you're searching for it. Maximum horsepower is the same as before, and the power delivery is still rather peaky, especially compared to turbocharged rivals.